Home > 9 Great Times To Give Someone A Gift Card – Even If It’s Not A Holiday! 9 Great Times To Give Someone A Gift Card – Even If It’s Not A Holiday! Everybody loves getting gifts – especially gift cards. Gift cards are the ultimate present, offering a fantastic blend of flexibility, thoughtfulness, and value. There’s nothing quite like getting a gift from someone special – it can really brighten your day, or help you get through a hard time. Birthdays are the most popular reason to give someone a gift, followed closely by the winter holidays – 94% of all adults in America celebrate Hanukkah, Christmas, Ramadan, or Kwanzaa, and just about everybody gives and receives gifts during winter holidays. Following these holidays closely are Mother’s Day, Father’s Day, Valentine’s Day, and other personal events like anniversaries and graduations. But why should giving gifts be limited to these holidays? Sure, giving gifts is traditional during these times – but that means people expect to give them, or to receive them. This doesn’t mean they don’t appreciate gifts given during holidays – but they are expected, in a way. So as special as holidays may be, giving someone a gift for no reason at all can be extremely impactful – and make someone special to you feel loved, appreciated, and cared for. To help you think of some great times to give gifts to people you love, we’ve put together this list of 9 times you can give someone an awesome gift – even when it’s not a holiday. You’ll feel great about giving someone a fantastic gift, and your recipient will be totally blown away by your generosity – that’s a win-win! Do you have friends with young kids? Are they going to school for the first time? Chances are that the weeks leading up to the first day of school are going to be extremely busy – and stressful. They’ll have to shop for supplies, register for classes, buy new clothes for the fall and winter, and deal with kids who may or may not want to go to school. All of this adds up to a lot of stress, headaches, and quite a few busy weeks. So make things easier for them with a great gift. If you want to help them have an easier time getting school supplies, consider giving them a gift card to Target or another large retailer where they can pick up pens, papers, erasers, backpacks, and even clothing! Or, if you want to give them a break from preparing for school, give them a gift card to a great local restaurant – and volunteer to babysit. They’re sure to appreciate some time alone, especially during the hectic days leading up to the beginning of the school year. Starting a new job is exciting – but it can be stressful. Chances are that you remember the night before you started your last job. You could probably barely sleep, for fear of sleeping through your alarm and missing your first day! Whether you know a teenager who just got their first entry-level position, or you have a friend making a career change, this is a great time to give a gift! When you give somebody a gift before their first day of work, you can give them confidence and support – and help them succeed right out of the gate! Giving a gift to a department store like Kohl’s, JC Penney, or Macy’s is a great idea if your friend or loved one wants to buy some new clothes. You could also consider a gift card to Staples or another office good store, so that your loved one can buy accessories like laptop bags, gift card holders, office supplies, and other basic necessities. Sending kids off to college can be a difficult experience – especially if you know a couple who is sending off their last or only child. It’s a time of adjustment. The period of “direct parenting” is over, and it can be tough to get used to being alone in the house. Because of this, it’s a good idea to lend emotional support to new “empty nesters” – especially if you’ve been through this experience yourself. You should make it a point to spend some time with friends who have sent their children off to college, and a great gift can help them feel better about this bittersweet time. In this case, the best gift card to buy would be one that helps take their mind off of things. Movie theaters, spas and massages, and other “self-care” gift cards are a fantastic choice. Chances are that you know somebody in your local community, church community, or group of family and friends who is sick or injured. Especially for families, there are two major seasons for sickness and injury. During the summer, kids are more likely to break bones and suffer injuries, and during the winter, large families often contract the flu, and spread it all between each other, leading to entire households full of sick kids and parents. Nobody likes being sick – especially not parents with sick kids. So if you have a friend dealing with injuries or sickness in their family, this is a great time to drop off some gifts, and make them feel special. You could drop off a gift card to a restaurant – along with some Gatorade, chicken noodle soup, and crackers in case they’re not feeling up to going out. They’ll love this act of kindness – anything helps when dealing with a house full of sick kids. If you’re a pet lover, you know exactly how this feels. Our pets are more than just animals – they’re family members. And losing them can be extremely difficult, whether from old age, accident, or even a runaway. When you lose a pet, you lose a piece of yourself, and you lose valuable emotional support. So if you have a friend who has recently lost a beloved pet, spend some time with them, and empathize with their situation. Let them know you understand their grief – and that it’s totally normal to feel this way about losing a pet. You should also avoid giving a gift card to a pet store or pet supply shop – though this seems good in theory, walking into a pet store and seeing other animals will only serve to deepen the wound. Instead, try to give them a gift card that will take their mind off things. If your friend loves arts and crafts, for example, you could give them a gift card to Hobby Lobby or Michaels – their hobby will give them a welcome distraction from the pain of loss. Life isn’t easy – and there are a lot of reasons that people can get down in the dumps, and have a really tough time. Whether it’s because of personal issues like a breakup, work difficulties, or anything else, sometimes your friends get down – and it’s up to you to help them back up. If you know that a friend is having some difficulties in their life, make it a point to spend some time with them, and build them up with encouragement and empathy. Don’t try to solve their problems – just help them realize that their problems can be solved. And don’t just lend a listening ear – give them an awesome gift card, too! This can really help brighten their mood. It’s a great idea to get them something that you can do together – if they love baseball, grab a gift card that’s’ good for a pair of tickets! By surprising your friend with a gift and spending time with them, you can really brighten their day, and have a positive impact, even if they’re struggling. Moving can be insanely stressful. Whether your friend has just moved across town or across the country, it’s probably been a really trying experience. It’s not easy leaving behind familiar surroundings, or getting to know people in a new community. Often, friends feel guilty when they move away – even if they have to do so for a career choice or for family reasons. So even if your friend has moved away, let them know that it’s okay – and that you still care about them, and will continue to value their friendship. A great way to do that is by sending an e-gift card via email to your friend who has just moved. Send them a gift card to their favorite restaurant, or to a new restaurant that’s nearby their home, and let them know that you’re thinking of them. This will mean a lot to them, especially if they’ve had difficulty adjusting to their new community, or forming new friendships. Whether you’re married, or just in a long-term relationship, a surprise gift can be a totally awesome way to break up the monotony of your relationship, and surprise your partner with something special. When you get a great gift for your partner for no reason at all, it’s a sign that you care – that you’re thinking about them all the time, and that you’re willing to go the extra mile to make them happy, even when there’s no “reason” to do so. 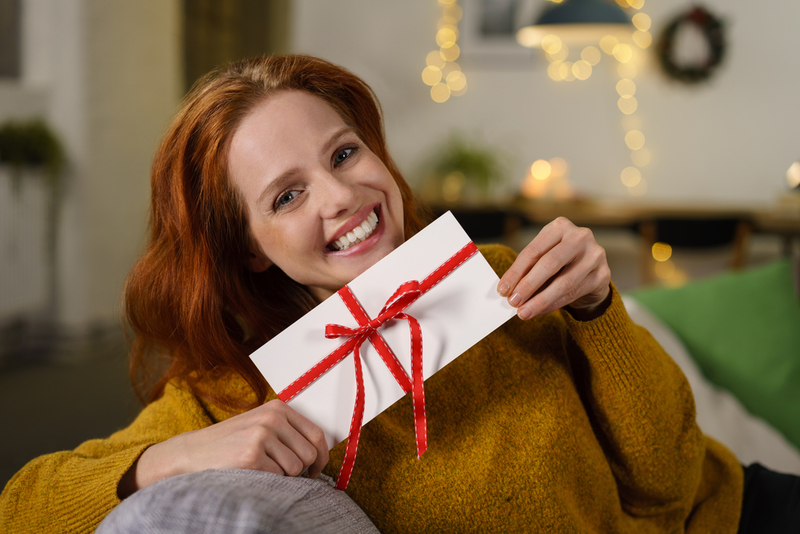 After all, people expect gifts on anniversaries, Father’s and Mother’s Day, and Valentine’s day – but if you give your partner gifts for no good reason, it helps show that you’re doing it because you really want to – not just because of holiday traditions. There are a few different choices you have when choosing a fun gift card for your partner. If they’ve been stressed out and are in need of a break, a salon gift card or a spa gift card is a good idea – everyone loves a massage! A gift card to one of their favorite restaurants is also a great idea – if you have kids, it gives you a perfect reason to find a babysitter and have a fun night out on the town. 9. To Cheer Yourself Up! Humans are naturally empathetic creatures. When we make somebody else feel good, we feel good – that’s just the way we’re wired! So if you’re feeling down in the dumps, consider giving a gift to somebody else. The impact you’ll make in their life will certainly make you feel better – and the best part is, it doesn’t even have to be a huge gift! Today, it’s easier than ever to give gift cards like Starbucks gift cards to friends, family, and loved ones – with just the push of a button. You can buy a bunch of $5 gift cards and send them out with personalized notes. The reaction that you get is sure to make you feel better – when you see how happy your friends are at receiving an unexpected gift, you’ll get a smile on your face. We guarantee it. Give The Gift Of The Unexpected – Try One Of These Awesome Gift Ideas Today! If you’re looking to do something a little out of the ordinary, you’ve got to try one of these great gift ideas. You don’t have to wait for Christmas, birthdays, anniversaries, or other special occasions to give awesome gifts – and these ideas are just the tip of the iceberg! Need some cash for gifts? Got some old gift cards you don’t need any more? Turn them into cash with EJ Gift Cards! EJ Gift Cards is a leader in the world of direct gift card buying, and we buy hundreds of gift cards for competitive rates. We also pay out directly through PayPal – as soon as you accept our offer and enter the details of your card, we will process your payments within few days. It’s just that simple, and it’s just that easy. So visit us today, and turn your old, unwanted gift cards into cash now!